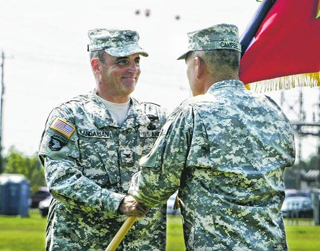 In a ceremony at Fort Campbell, Ky., earlier this month, Army Col. Arthur Kandarian, of Washington and Lee’s Class of 1986, turned over command of the 2nd Brigade Combat Team, 101st Airborne Division, which led the surge in Afghanistan during the past year. During the ceremony, Art received the Legion of Merit; his wife, Faye, was presented the Outstanding Civilian Service Medal and the Commander’s Certificate for her support of soldiers and their families; and the brigade was given the Valorous Unit Award for its success in Afghanistan. A story about the event in the Clarksville (Tenn.) Leaf Chronicle relates Art’s description of his unit’s heroism on the battlefields of Kandahar Province, which the Soviets had called the “Heart of Darkness.” Those successes include the brigade’s ability to dislodge the Taliban from its birthplace, the construction of critical infrastructure, and the training of a new Afghan National Army brigade. Richard Sykes '13 was among the W&L students attending the NIH event. For 19 of the Washington and Lee undergraduates who are spending their summer in the University’s science laboratories, the road trip that the Career Services Office organized last week was an opportunity to peer into their future. At 6:30 a.m., the students left in vans for Bethesda, Md., where they joined students from Washington-area colleges at the National Institutes of Health Graduate and Professional School Fair. There, they participated in workshops on interviewing, getting into graduate and professional school, M.D./Ph.D. programs, and careers in public health, psychology and pharmacy. In addition, almost 120 colleges and universities from across the U.S. sent representatives of their graduate schools, medical and dental schools, schools of public health and other biomedical programs, permitting the W&L students to learn more about these areas. Not only did the road trip give the participating students a preview of what might await them once they leave W&L, but it was also a valuable experience for the Career Services office, according to Beverly Lorig, its director. 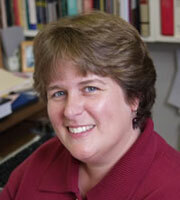 “I came away with ideas for building career-related programs linked to the existing W&L summer programs,” she said. A little more than a year and a half since Washington and Lee alumnus Paul Trible started his shirt-making business, the company, Ledbury, is getting regional and even national recognition. All this in a year when they expect to sell 10,000 shirts. We first blogged about the new business in January 2010. Earlier this month, the company was featured in the Richmond Times-Dispatch’s “Startup Spotlight.” That article features an interview with Paul, of the Class of 2003, and his business partner, Paul Watson, about their plans to add the Commonwealth Collection, which will feature belts, cuff links and garment bags from Virginia-based artisans. Former Washington and Lee women’s basketball captain Bethany Dannelly, of the Class of 2005, has just been named an assistant coach at Colby College, in Maine. Bethany still holds the career records for assists (459) and steals (197) as the Generals’ point guard. She never had fewer than 84 assists and 42 steals in a season. Bethany got some valuable coaching experience at the University of Virginia, where she earned her master’s degree in physiology from the Curry School of Education. Last year she served as assistant director of operations/video coordinator for the Cavaliers after previously serving two seasons as a graduate assistant. She handled daily operations of the women’s program plus all game film and scouting video work. At the same time she was working with the U.Va. intercollegiate program, Bethany was also coaching the university’s club basketball team. There she compiled a career record of 87-3 in three years, guiding her team to national semifinals berths two years in a row. At Colby, Bethany joins first-year head coach Julie Veilleux on the Mules’ staff. Emeritus philosophy professor Harry Pemberton remembers artist Cy Twombly's Lexington days. Much has been written and said about artist Cy Twombly, the Lexington native and member of the Washington and Lee Class of 1953 who died on July 5 in Italy. But until W&L alum Bruce Young’s video remembrance of Cy for Roanoke’s WDBJ7, we didn’t know what his favorite breakfast was at the Lexington Restaurant — two poached eggs on English muffins with sausage and grits. Bruce, a 1982 graduate of W&L, conducted interviews with Washington and Lee and Lexington folks to give a rich sense of Cy’s roots in Rockbridge County. Included among the interviewees were W&L art historian Pamela Simpson, emeritus philosophy professor Harry Pemberton, University photographer Patrick Hinely ’73 and Butch Bryant, who once worked in the University’s Warner Center but spent many years as Cy’s right-hand man in Lexington. In addition to the feature that appeared on WDBJ, the website has two separate interviews — one with Patrick and one with Butch — that help capture the essence of what Cy’s Lexington days were like. When a contributor to the Miller-McCune magazine needed an expert, he knew who to call: Suzanne Keen, the Thomas H. Broadus Professor of English and chair of the Department of English at Washington and Lee University. Suzanne is quoted at length in an article titled “Teaching Empathy to the ‘Me’ Generation,” by Eric Leake, a Ph.D. candidate in composition and rhetoric at the University of Louisville. Suzanne, of course, is well known for her scholarship on empathy. Her 2007 book, Empathy and the Novel, examines the topic in depth. You can read the entire article here. And you can read more about Suzanne and her scholarship here, in this article about her 2008 Outstanding Faculty Award from the State Council of Higher Education for Virginia. If you are a royal watcher, this has been a few months to savor, what with Prince William marrying Kate Middleton and Prince Albert of Monaco marrying Charlene Wittstock. Washington and Lee alumna Jane Lee, a 2009 graduate, has it all covered with her video report for Forbes Lifestyle. After receiving her degree in journalism from W&L, Jane earned an M.S. at Columbia’s Graduate School of Journalism. She’s been with Forbes for almost a year now, moving to her current position in March. She manages online content, multimedia and video. You can read her Forbes profile here. When she hasn’t been paying attention to the royals, Jane has done stories ranging from a feature on a Lego artist to how Oscars jewelry makes it to the red carpet.